One of a kind. 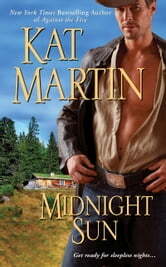 Kat Martin's heroes are as rugged and tough as they come, but honor rules no matter how hot the temptation. . . Call Hawkins just wants to be left alone and leave the past where it belongs. The bleak beauty of Dead Horse Creek is a perfect place to get away from the world. . .a place where nothing exists to remind him of everything he's lost. His isolation is complete--until Charity Sinclair arrives fresh from New York City. Stunningly beautiful and stubbornly independent, she's also shamefully ignorant of the untamed wilderness. . .and the very real dangers she'll face if Call doesn't teach her a thing or two. But even with Call's grudging help, Charity's dream of life in the Yukon may have led her into something much more savage than the forest: A menace as endless as the long days that run together without darkness--and a killer who won't let anything come between him and perfect, deadly vengeance. . .